As I will be very busy with other things throughout the upcoming week, I wanted to go ahead and provide an update on what I have been working on recently. Although I don’t have the next release ready yet, I have been putting a lot of time into other areas that, up until now, have not gotten quite enough attention. I am happy to announce that I now have some (long overdue) Getting Started guides available for those who are new to RPG in a Box! There are currently three available and they can be accessed from the main wiki page. The third guide, Creating a Custom Game from Scratch, is a more comprehensive walkthrough and includes additional detail around creating your own custom content, such as maps, tiles, and scripts, from the ground up. It is useful if you want to learn the process of creating a game with RPG in a Box from beginning to end. 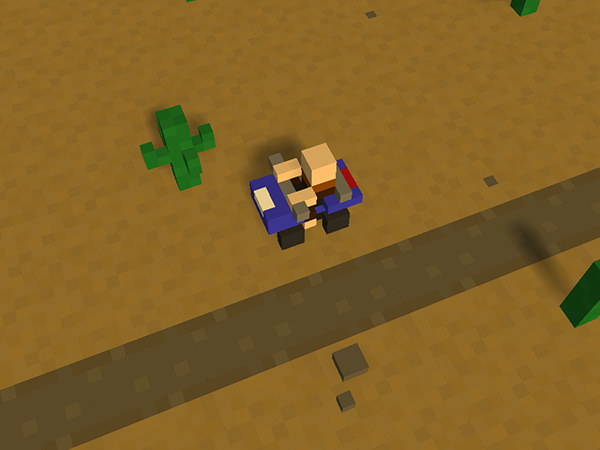 Check out the images below for a preview of the desert-themed game you will be creating by following this guide! I also added links for the tutorials that currently exist on my IndieDB page for easier access. From this point forward, I plan to continually keep the wiki up to date as new versions of RPG in a Box are released so that any new features or changes are documented. On a related note, I also updated theFeatures page of my main website and will keep it up to date with each release to reflect the current capabilities of the software. I now have a page up on my official website with some detail around Founder’s Access for RPG in a Box. 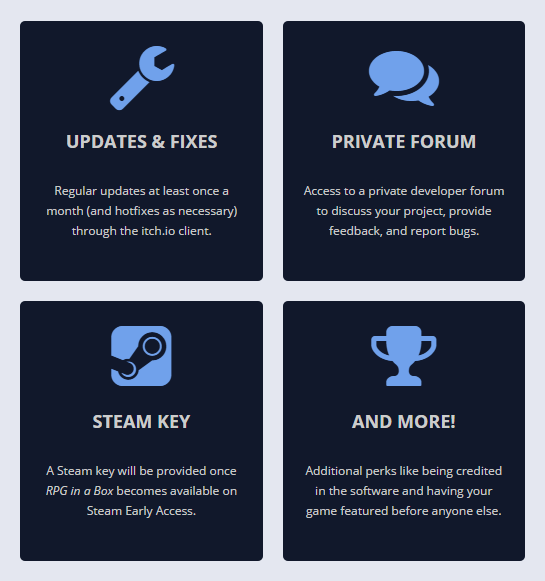 Founder’s Access could be considered a “Pre-Early Access” period as I would like to improve some of the existing features before releasing it on Steam (for example, polishing the dialogue editor and dialogue system so they are more complete and functional). It is intended for those who have a game idea in mind that they’d like to create with RPG in a Box (or even for those who would just like to show their faith in the project by supporting it earlier on). During this time, I would like to work with a small and limited group of people who are willing to help thoroughly test the software and provide suggestions and feedback. While I cannot guarantee when or if certain features will be implemented, I am interested in finding out what functionality would be beneficial for your games. This will help me to plan ahead and to move RPG in a Boxforward in a positive direction as I work towards the Steam Early Access release. The boxes below provide a high-level overview of what will be included with Founder’s Access. One of the tools included in the Refinery toolset at Itch.io is their butler tool. This will allow me to push out updates & fixes more frequently and more easily. I am planning for the Founder’s Access period to begin sometime around the middle of August and continue for several months (most likely through the end of the year). After the period ends, I will be releasing the software on Steam Early Access. Thank you for reading! I am looking forward to August and jumping back into the development of RPG in a Box!